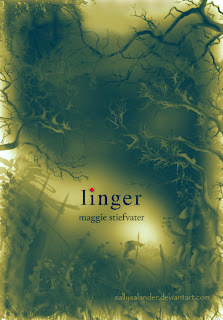 Maggie Stiefvater has a sick sense of humor. Seriously. And I say this in the most flattering way possible. If you've read the series then you'd know how I felt when I closed the book. This is pure torture! I tell you, Stiefvater's intentions are not pure when she wrote this, she's hell bent on making the story as tragic as possible. I can just imagine those who've patiently waited for a year before reading the conlcusion to this series. This is the story of a boy who used to be a wolf, and a girl who became one. So, the meningitis worked and Sam is now human. Unfortunately after years of suppressing the "toxin", it seems that Grace is not strong enough to stave off the urge to turn. And that she did. Seriously, these two people's happy ending will not be easy. I just hope that they do stay together FOREVER (as the third and last book of the trilogy's title implies). What I liked is that them turning into Werewolves, or not, made sense. Though far fetched, Cole's logic about their condition makes sense. Another thing that I liked is the story is not complicated but the emotions that were entailed to it are. Misery does love company and Isabel and Grace's unlikely friendship is beautiful as well. They never saw it coming nor did they expected it but in the short period of time that they've bonded over Jack's death and all the shiznit that followed made them loyal to each other. I think Stiefvater modeled Isabel's character after herself. Isabel is this fearless, quick-thinking, gorgeous girl who is the voice of reason in this story. I like that nothing fazes her and she makes the best out of every situation. If you've seen some of Maggie Stiefvater's interviews, you'll understand why I mean. Another newbie that I like is rocker, Cole St. Clair, who is incidentally Isabel's love interest. They are a perfect match, both arrogant and always armed with a rebuttal. I immensely enjoyed their banter, such electric chemistry between these two. Theirs is another story I wish will end happily. So now Grace is a wolf... what happens next? This book was pieced together very well and transitioned from Sam's point of view to Grace's point of view easily. However, I wish their way of speaking (when it was their turn in 1st person) differed just a bit more so I really knew when I read that that was Sam speaking and not Grace. There were also many scenes of romance when it was teetering on the edge of being gushy, though never crossed that line. This is a true romance book with just a bit of thrill in it that held me from beginning to end. I didn't notice that but thanks for bringing it up. It would surely enrich the characters more if their "tone" were a bit different. I love the love story with these two. But being teenagers I think gushy is part of the territory.